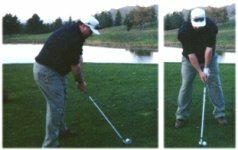 It's best to start with a short iron when learning to swing, as these shorter clubs are far more forgiving and manageable than the longer clubs and it is much more likely that you will have success with them. 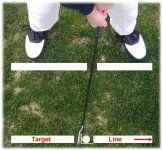 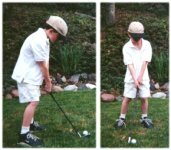 Align the club face perpendicular to the target line and your body parallel to the target line (see picture). 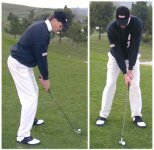 Stand with your heels about the same width as your shoulders, spine bent forward from the hips with your knees flexed in a balanced, ready position -- weight evenly distributed between both feet and between heels and toes (see pictures).